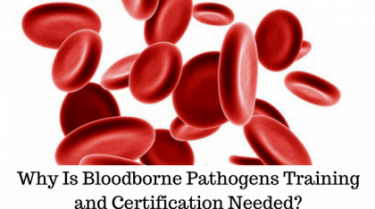 Why Is Bloodborne Pathogens Training and Certification Needed? Bloodborne pathogens are microorganisms in blood that are infectious and can contaminate other humans. Bloodborne pathogen training is geared towards people who work in jobs where they are exposed to blood and other bodily fluids, which can be potentially hazardous to their own well-being. Healthcare professionals need to be educated in bloodborne pathogen risks as an important part of their training. The first step in finding the right course is understanding the reasons why training is critical. Here, we outline some of the key reasons why a person should become certified by outlining what some of the main hazards are.